Log into WHM and search “ConfigSe” in the top, left-hand side bar. Click ConfigServer Security & Firewall. 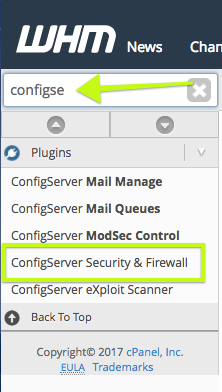 Scroll down to the csf – ConfigServer Firewall section. To unblock an IP address, type the IP into the green field shown below, then click Quick Allow. Follow the same process for Quick Unblock. To block an IP address, type the IP into the red field shown below, then click Quick Deny.